Imagine gathering with 8,000 like minded men in Lynchburg. Fathers, sons, brothers, Christian and non-Christian, coming together to worship God and learn more about a life of true adventure He intends for us. Now, imagine a two-day event packed full of workshops, exhibits, and fun around the stuff that men love: baseball, hunting, fishing, football, motorcycles, racing, extreme sports, and more, featuring some of the leading experts in the world. 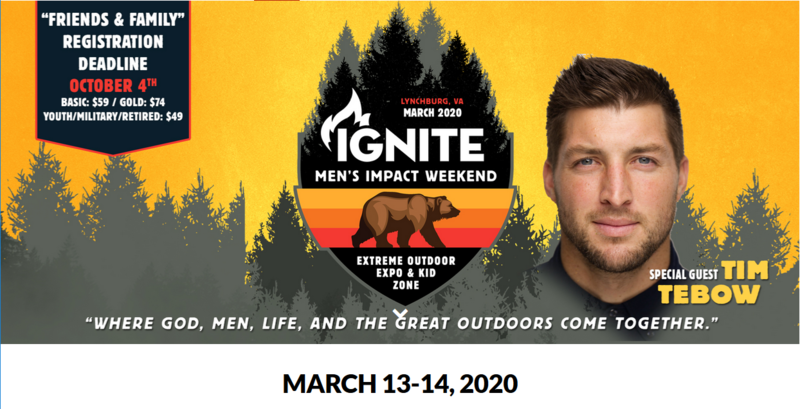 Here’s the Ignite Men’s Impact Weekend Conference! This conference is to help men take on the everyday challenges they face: a godless culture, fatherless families, broken relationships, and the lack of male leadership in the Church. The Ignite Men’s Impact Conference weekend is scheduled for March 16-17, 2018.